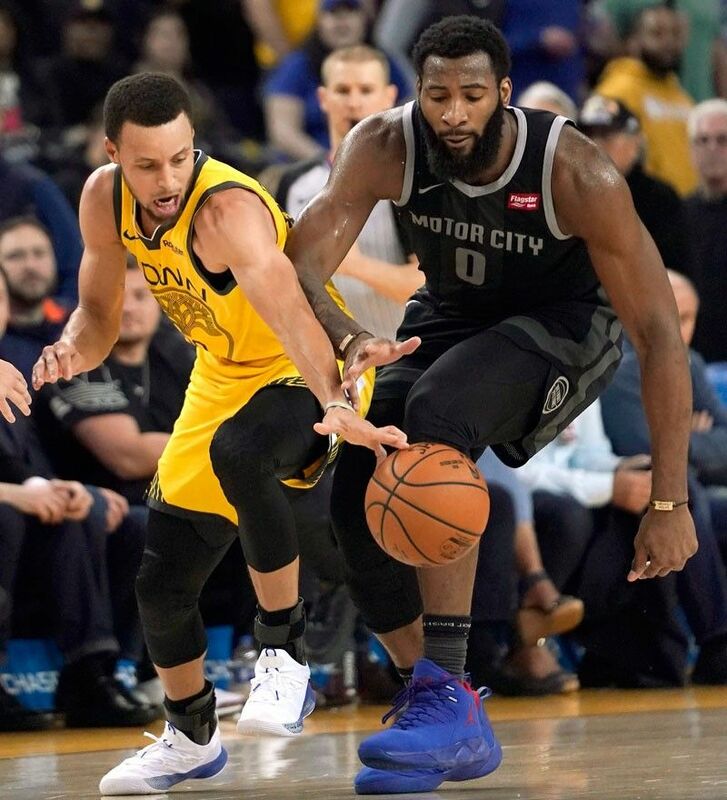 Golden State Warriors guard Stephen Curry (left) and Detroit Pistons center Andre Drummond grapple for ball possession during the second half of an NBA game in Oakland, California. MANILA, Philippines — Stephen Curry returned from a one-game absence to hit five 3-pointers and total a game-high 26 points Sunday night as the Golden State Warriors shook off the embarrassment of a 35-point loss to the Dallas Mavericks one day earlier to turn back the Detroit Pistons 121-114 in Oakland, California. The Golden State win, coupled with Denver’s loss at Indiana earlier in the day, allowed the Warriors to move a half-game ahead of the Nuggets in the race for the best record in the Western Conference. In Boston, LaMarcus Aldridge scored 48 points and grabbed 13 rebounds as visiting San Antonio rolled to a 115-96 win over reeling Boston to snap a two-game losing streak. In New Orleans, James Harden scored 28 points and Houston clinched a playoff berth with an easy 113-90 victory over host New Orleans. Harden, who leads the NBA with an average of 36.4 points per game, didn’t sustain the pace that saw him score a combined 118 points in the previous two games, but it wasn’t necessary. He played just 29 minutes as the Rockets rolled to a 14-point lead at the end of the first quarter and cruised to their 14th victory in 16 games and remained in third place in the Western Conference. In Los Angeles, LeBron James had 29 points, 11 rebounds and 11 assists to lead Los Angeles past Sacramento 111-106. In Milwaukee, Giannis Antetokounmpo collected 26 points and 10 rebounds as host Milwaukee posted a 22-point victory over Cleveland, 127-105. Kevin Love highlighted his 20-point performance with four 3-pointers and added 19 rebounds for the Cavaliers, who fell to 6-30 away from home. Jordan Clarkson scored 19 points, and rookie Collin Sexton added 18 in the loss. Other results: Clippers 124, Knicks 113; Hornets 115, Raptors 114.